This Book of Memories memorial website is designed to be a permanent tribute paying tribute to the life and memory of Catherine Perez. It allows family and friends a place to re-visit, interact with each other, share and enhance this tribute for future generations. We are both pleased and proud to provide the Book of Memories to the families of our community. Catherine Pauline Perez, 80, died Tuesday, March 27, 2018 at Garden Valley Retirement Village in Garden City. She was born April 1, 1937 in Ingalls, Kansas the daughter of Fred & Anna Cecilia (Kowalski) Kuddes. Catherine grew up and went to school in Ingalls, Kansas. On August 25, 1956, she married Tony Perez in Ingalls, Kansas. They moved to Garden City after their marriage and have lived in Garden City since. Catherine worked as an office manager at Farm Management in Garden City. She was a member of St. Mary Catholic Church and the Daughters of Isabella. 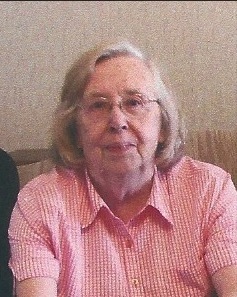 She enjoyed sewing, reading, traveling, and spending time with her family. 3 Great-Grandchildren. Catherine is preceded in death by her husband, Tony who died in 2005. She is also preceded in death by her parents; 3 brothers Charlie Kuddes, Fred Kuddes, Jr., and Bill Kuddes; and 2 sisters Emma Jo Smith and Evelyn Kuddes. A rosary will be held at 7:00 p.m. on Wednesday, March 28, 2018 at St. Mary Catholic Church in Garden City. Funeral Mass will be held at 10:30 a.m. on Thursday, March 29 also at St. Mary Catholic Church with Fr. Charles Seiwert as Celebrant. Burial will follow at Valley View Cemetery in Garden City. Friends may call from 2:00 p.m. to 5:00 p.m. on Wednesday at Garnand Funeral Home in Garden City. The family suggests memorials given to St. Catherine Hospice or to High Plains Public Radio both in care of the funeral home.